If you read my Dining Room Makeover post from earlier in the week, you’ll know that there is some decorating and redesigning work going on in our home. Following on from that I wanted to share these fabulous dining chairs that I picked up on the Tesco Direct website the other day for an absolute bargain! 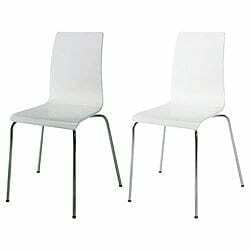 This pair of Padova Dining Chairs in White were retailing at £79.96 and last Saturday I bought them for just £19! Yes, that’s right, £19. I bought 2 lots and in due course I’ll let you know what they’re like. There weren’t any reviews on the site at that point but I figured they’ve got to be reasonable quality at around £40 each. Watch this space. What are baragin mama you are. Excellent deal! That’s a proper bargain. I’m on the hunt for a chair too, just one though. I’m thinking maybe Home Sense?